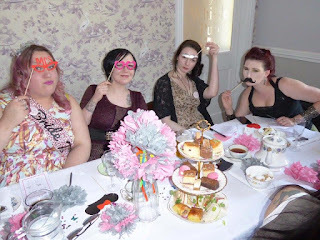 Kitty Rambles A Lot: A Morris-Wood Wedding : My Hen Party! The Bank Holiday weekend brought along some surprisingly nice weather, and also my hen party! I was so excited, 3 of my 4 bridesmaids made it, and several people travelled a few hours to be with me for it which is just incredible. I was so touched! As my Mum made amazing DIY decor I had to share her hard work and how fun the day was. We had afternoon tea at Healing Manor and were really well looked after. They let us decorate the room and made sure we had everything we needed. We went with a grey and pink theme and it all looked so beautiful. Every decoration was made by my Mum! The flowers in the vases and on the tables are all made of tissue paper and my Mum worked really hard on them. She has become so crafty and I couldn't be more thankful! Each table setting had a quiz my Mum made, and also a personalised badge for each guest made by Pink Biscuits. The badges were such a cute touch and everyone wore theirs for the whole day which really made me smile! My Mum even made the bunting. The colour themed look so damn pretty! And as it turned out.... it matched my new hair! Yep. After almost 3 years of no dying or colouring, I couldn't resist. I feel so much more like me! My bridesmaid and generally wonderful friend Alivya did my hair and makeup for me for the day which was a lovely surprise. She is also doing my hair and makeup for our wedding, you can book her via her website here. I felt like an absolute princess. Such a girly look for me and I adored it! Me and my Chief Bridesmaid Fal. Me, Fal, Alivya and Roswell Ivory, 3 of my bridesmaids, we missed you Jess! We're so serious. My Mum made these fab little quiz packs for each guest and myself, it was hilarious hearing everyone's answers and what they thought Stu or I would have said. Each guest was also asked to write down a funny or embarrassing memories they have of me which were read out. Some made me cry with laughter, one or two had me shed a tear, it was wonderful and I've kept them all. I was so shocked to receive a present! Our family friends Helen, Lauren, Vicky and Megan gave me this beautiful personalised compact mirror which really blew me away. It'll be in my handbag on the day! I got changed for the evening portion of my hen party into something a little more suitable, as we went to Yardbirds to see Anti-Nowhere League! I was hugely into punk as a teenager, so it was a really nostalgic evening. 39 people came to the day, and 11 of us went to Yardies, which I really appreciate as I know punk isn't for most people. I've blogged about this dress in more detail here! Me and Fal, and a sneaky Becky in the background. I had the most wonderful day, and I am so grateful that so many people came out for me and shared in my day. I felt so loved and to be around so many of my friends and family together warmed my heart. Huge thanks to my Mum for all the DIY she did, and also to Fal for helping with the quizzes, and to Alivya for my hair and makeup, and to Fal, Alivya and Roswell for helping decorate the room! Now.... bring on the big day! *denotes an item that was gifted to me for review purposes. In no way does this impact upon my opinions which are entirely my own. This post contains affiliate links.